Days of Preparation: Week Six/Session Two. Theme: God’s Call to Me. Our reading for today: Mark 10: 46-52. Do you remember the ‘ole chicken versus the egg controversy? So which comes first when hearing and responding to the call of God in our lives? God’s call to me? … or me calling out to God? Which comes first? Hmm. Tough call, isn’t it? 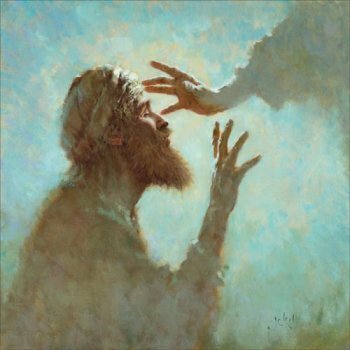 Yet in today’s Bartimaeus story, it seems pretty obvious that it was this blind beggar who took the initiative when it came to filling in the blanks with his God story. As a matter of fact, I don’t think this guy’s name would ever have been remembered if he’d stayed by the roadside and obediently followed the instructions of the crowd. But Bartimaeus would have nothing to do with the heavy-handed pressure being put on him to pipe down! Jesus was leaving Jericho and this was his last chance to get the Nazarene’s undivided attention. Who knows? It could be that Bart had been following Jesus around for several days, trying to get the Master’s attention? But no luck. The crowds were thick and nearly everybody in town wanted to be around this amazing, wonder-working rabbi from Nazareth. Kinda reminds me of a beautiful summer day back in August of 1966. It was Municipal Stadium, Kansas City, Missouri; home of the baseball team, the Kansas City A’s. I was a huge Baltimore Oriole fan and that year, the Orioles were on their way to the World Series. After a bit of begging, my folks decided to take a short summer vacation to Kansas City so we could see my Orioles beat up on the hapless A’s. We got to the stadium early enough to watch the teams warm-up and as the Orioles were heading back into their dugout, the crowds were lined up trying to get autographs from some of the team’s most popular players. My hero, of course, was everyone’s hero…Brooks Robinson, the amazing third-baseman who was the cornerstone of that 1966 World-Champion Oriole team. As the crowds pressed in, my mom and I tried our best to push closer to the dugout wall, but the situation seemed hopeless. Too many yelling fans. Too many voices calling out. As Brooks Robinson stepped into the dugout, there I stood with my 1966 Oriole Yearbook and a pen in hand hoping my hero would see me and respond. Sadly, he passed right by and my hopes were dashed. In retrospect, I don’t know which startled me more! Was it Brooks Robinson, who suddenly turned back toward me to sign my yearbook? Or was it my mom’s totally out-of-character boisterous voice that literally startled nearly everybody in the crowd? Either way, I got my autograph that day and somehow, I’m thinkin’ that Bartimaeus, on that fateful day in Jericho, and my mom, on that warm summer day in Kansas City, must have had something in common. As I see it, when it comes to getting something from God that you really, really know that you really, really must have, you and I just might need to be a bit more like Bartimaeus or my mom…who wouldn’t let anyone or anything stand in the way of their getting their prize. Hmm. Thanks mom! Thanks Bartimaeus! I needed that reminder! My prayer: Jesus, this story truly reminds me that there will be times in my life when my circumstances will call for ‘out-of-the-box’ behavior. In truth, desperate people do desperate things, and in this case, I know that You do honor those who will not hold back or be silenced by negative peer-pressure. Lord Jesus, Son of David, have mercy on me, a sinner! For Your name’s sake. Amen. My questions to ponder: So what pressures to conform are holding me back from pursuing all I want and need in my relationship with Jesus? Am I staying quiet because I’m afraid of public opinion? Am I shrinking back because of my insecurities or fear of rejection? What might it look like for me to be more like Bartimaeus today? This entry was posted in Our Ignatian Prayer Adventure and tagged Bartimaeus, Jesus, Kansas City, Son of David by The Contemplative Activist. Bookmark the permalink. Pastor Marty I have not needed to hear a message so much as I did this one today. Thank you for sharing your thoughts on this.